The Exclusive Lords and Ladies Club! “Right, so what have you got to eat?” Harry asked taking a seat in a wobbly wooden chair, the girls following suit. Three helpings of Shepherd’s Pie landed with a thud before the three hungry kids and they tore right into the goods. There was no conversation, just the bustle of the business and the snapping of the fire. Three foamy Butterbeers balanced on a round tray were brought over by a tall, thin woman wearing a white cap and dark dress. “Thank you,” Libby said between bites of the warm and satisfying food. She took the handle of the stein and drank deeply of the sweet and satisfying beverage. The creamy foam that rested on the surface clung to her lips so that she had to wipe her mouth. It was such a mystery to her, the creamy goodness and the hint of butterscotch or caramel. She suddenly smiled, feeling uplifted and happy; content. There was a man seated at the end of the long table reading a newspaper, steam rising from his own beverage. The headline on the paper blared at her even from the distance between them and a figure on the front page moved from side to side. “Escape from Azkaban” was what it said. “Is that picture moving on the paper?” Libby asked not moving her eyes from the paper. Harry looked uncomfortable, as if a cloud just descended over him. “So who is that? The picture of the man? Is that what I’m seeing?” Libby continued. Libby swallowed hard, her mouth suddenly feeling dry. She drank again from her cup and fell silent. “Good to see you made it back, Potter,” Professor McGonagall said suddenly standing before them with her arms crossed over her chest and looking as stern as she had earlier that morning. “We got all the shopping done, Professor,” Harry answered. “I gathered that by the amount of packages,” she said with a twitch of her lips as though she wanted to smile. Libby merely nodded, her eyes flicked to Harry trying to read the hard lines on his young face. Was that fear that stared back at her through the rounded spectacles? Or did he resent her for having to babysit her? She felt uncomfortable and didn’t want Harry to hate her. With a nod, McGonagall stood and walked away, her posh, green velvet cloak billowing in her wake. “It’s okay, Libby. Really. I’m here, you’re here…we might as well stick together, right?” he smiled back at her, the harshness gone from his face once again. “So why are you stuck here like me?” Libby asked, wondering about his family and if they knew he was gone too. “I blew up my aunt,” he said and laughter bubbled up inside of him, escaping as a snort. Libby’s eyes grew huge at the visual. “Not blew her up, blew her up…I inflated her like a balloon for bad-mouthing my parents. She ended up floating away. You should have seen her face when her necklace burst from around her fat neck and she couldn’t hardly move. Teaches her to throw insults around. But the Minister of Magic put her right and made her believe a story about what happened. So now we wait until the train comes,” he said with a grin of satisfaction at the memory. “I’m sure Ron’s family would take you in if you ask, Harry,” said Hermione. The three of them returned to eating, no one saying another word, and Libby sneaking peeks at the wild looking man on the front of the newspaper at the end of the table. When every bite had been eaten and every drop had been sipped, Harry stood and the legs of the shabby wooden chair scraped against the stone floor. “I will help you take your things to your room,” he said sounding tired and very worn out for a young boy. “It’s okay, Harry. I can get it…I just need to know where my room is,” Libby giggled softly. “Oh please,” said Hermione rolling her eyes, “we are here to help you so just say thank you, Libby.” She grabbed a few bags and started for the rickety looking staircase. Harry hurried to take some also and Libby took hold of Serendipity’s cage and her bag of robes and the like, hurrying to catch up. Harry turned to Libby as she came up on his right going up the creaky old stairs. “Don’t mind her, she wasn’t trying to be rude. She is just very to the point sometimes. You will learn that we are happy to help you. Not because McGonagall told us to, but because we want to. If friends offer to help, just accept it and be glad you have good people in your life,” he smiled warmly. “It’s just that…well, I haven’t had friends for a long time. I’ve always been kind of a loner and a misfit. But I’m glad I ran into you guys. You’ve been great to me,” Libby answered feeling strange revealing that part of her to Harry. “Is Hermione…like…your girlfriend?” Libby asked innocently. “She’s very smart. I can tell that,” Libby said trying to be positive after such a blunder. Hermione had opened the door and was putting the bags she carried on a table to the left of the large four posted bed with a faded blue velvet canopy and curtains that looked like it was hiding under years of dust. The wooden floor creaked with every step and Libby could hear the wind racing over the roof. A shudder stole through her. “Hey, Hermione…” Libby called out as Hermione was about to walk through the door. The frizzy haired girl turned around with eyebrows raised in question. “Thank you. For everything today. I couldn’t have done it without you guys,” Libby said with a racing heart. She was afraid of being rejected or ridiculed. It was difficult at best to express her emotions. It hurt so much less just to hide them inside. “I’m going to bed as well. We will talk more tomorrow,” Harry said setting Libby’s treasures on the floor beside the table and retreating to the hall. Libby blinked her eyes awake, the sunshine of the late summer day pouring through the grimy window, and she sat up with a yawn that threatened to make her lungs explode. The tips of her fingers massaged the sleep from her eyes. She had almost forgotten where she was. But the sight of the old door barely clinging to its hinges brought back the events that had happened the day before. This was not her bedroom of soft baby blue with ruffles on the bedspread and feminine white posts reaching to the ceiling. However, although it was not her pretty, young girl’s décor, this world felt more like home than being back with her family. Climbing from beneath her covers, she went to the mirror and looked into the warped, rippled glass. It reminded her of a fun house mirror and she smoothed her hair that was sticking up. Her clothes, her only clothes, were still out of place and bright compared to her surroundings. She opened the bag of robes and pulled out a plain black one that actually fit her slight frame, a gray pleated skirt, white button-up shirt, and a gray knitted sweater. In the bottom of the bag, she found the black tie with a colorful crest adorning it. Carefully, she dressed herself, taking pride in how the clothes transformed her. She was a new person in a place where she belonged. Turing to look in the mirror again, she spied two gray socks and a pair of black shoes on the end of her bed. Moving slowly in a circle, Libby searched for the person that entered her room unannounced but found no one. Leery, she hesitantly picked up the socks and drew them on, the tops coming to her bare knees. Then she slipped into those shiny black Mary Janes that gleamed in the morning sunshine that streamed through her window. There was a knock on the door and Libby visibly jumped, her heart lurching into her throat. She opened the shabby door just a crack and peered out into the hallway. She saw a sliver of Harry and let out a breath of relief, opening the door fully to him. “It’s just so…” she started. “Okay, let’s go,” she said with a smile of thanks. Harry gave her courage. It seeped out of his body like sweat and she could breathe it in like air when she was around him. It filled her up and made her feel strong, as if she could do anything. She just needed to stay close to him, she decided in her mind. She needed him to lend her his courage and self-assurance. It was bustling and noisy at the bottom of the stairs. So many bodies in such a small space. But Libby could see several bright red heads bobbing from here to there and all over the space. Hermione was seated on a stool holding her cat and talking with another girl that Libby had never seen before. Seconds later, a man Libby assumed was the Weasley father took Harry aside and around a pillar. He was talking quite seriously to Harry and Libby felt that courage fade within her, leaving her feeling shy and awkward around all these people she didn’t know. Hermione caught her eye, she was waving Libby over. As Libby started toward her, the young girl, Ron’s sister fell into step with her. Ginny was warm and bubbly, a feeling that Libby liked almost as much as the courage Harry lent her. She followed Ginny and motioned to Hermione to come sit with them. “Yes. He feels very protective over Harry. He wanted a word with him about the prisoner that escaped Azkaban. He feels like Harry is in some kind of danger. It seems Harry is always in danger,” Ginny sighed. “Thank you, I love them!” she replied with a smile that stretched her mouth wide and showed her crooked teeth. Almost immediately, she sobered and closed her lips tight. “Can I ask you a question, Libby?” Ginny asked after swallowing a bite. “Sure,” Libby said and a feeling of nausea crept into her belly. It was never good when people asked permission to ask you a question. “I really don’t know how I came to be here. Professor McGonagall told me that Dumbledore would explain everything when I get there. But it feels weird to be the only one that talks differently,” Libby said, once again feeling out of place when she had just started feeling comfortable. “Don’t worry about that…It makes you unique. It’s refreshing,” Hermione said with Ginny nodding in agreement. Hermione took Libby by the shoulder, steering her toward the door. “Wait! My things!” Libby shouted above the chaos. Ginny sent over an exasperated look but there was some fear in her face. “Hopefully the snakes are all gone and Tom Riddle stays away from me,” she said with half a laugh, making light of something she obviously feared. “You don’t like sleeping in cold, damp, dungeons, Ginny?” Hermione said very sarcastically. “Not in the slightest,” was her snarky reply. Libby had no idea what they were bantering about, but she made a mental note to ask more about that story. It sounded to her that Ginny had a rough year her first year. Fear of the unknown seized her lungs and she kept running threads of imagination in her mind, conjuring up the worst of circumstances. “Walk a bit faster,” the shrill voice of Ginny’s mother rang out over the streets of what appeared to be London…from what Libby had seen from photos. “Next stop, Kings Cross Station!” said one of Ginny’s brothers. Looming in the distance was a large building of brick and arches. It was huge. Probably larger than anything Libby had ever seen. She wondered if the bricks opened up and transported them to Hogwarts, just like the wall opened up to The Leaky Cauldron. But she continued following the red haired family with Ron, Harry, and Hermione right behind her. They entered through the ordinary, plain door; as everyone else did, and they were blasted with a rush of cool air compared to that of outside. They were hurrying so fast, Libby was not able to take everything in. But she was thankful that Ron’s mother knew the way. She would have been so lost if she’d had to figure it all out alone. Stepping into the area with numbered posts and trains sitting lazily in wait of their cargo to board, Libby could hear someone counting as they passed each post until they came to number nine. “Platform Nine,” the mother said with conviction. “All right, Fred. You’re up.” And she clapped her hands to hurry him along a bit. Just as Fred was looking like he was going to sprint at the wall, a loud crashing sound interrupted them and Libby recognized some of the grown-ups from the shabby tavern. They were each pushing two carts laden with trunks and animals in cages. “Here! Take your trolleys, kids!” bellowed Ron and Ginny’s dad. All seven children scurried over to find their own cart and then Fred and George took off at a full run and disappeared into the very solid looking brick wall. Libby cast around to see if anyone noticed the odd happenings, but no one seemed to care in the least. The other people, the muggles, were so engrossed in their mobile phones, their newspapers, or novels that they had no idea what was going on around them. “Go on, Libby, you’re next!” urged Ginny. Libby looked around for Harry but he seemed to have already gone ahead. “Just get a run at it, dear. You will go right through. Like waking up after a dream.” Mrs. Weasley prompted. Libby’s heart began to race and she started breathing rather heavily. Wiping her palms on her robes, she gripped the trolley tightly. Deep breath in, deep breath out. And off she went, the wall looming closer and closer. As she came dangerously near, she closed her eyes tightly and held her breath, bracing for the worst. When there was no crash, no falling, and no screaming, she opened her eyes and slowed her pace, nearly bumping right into Ron. She was facing a beautiful black train with gold lettering and red trim in places. There was a crest on the side of the puffing engine and the compartment doors were gaping open in welcome. A high pitched whistle blew and all the kids picked up their pace to find a spot before they were all taken. Suddenly, Ginny was right behind her. “Come sit with me, Libby!” she called out over the din. Libby looked over the crowd in search of her friend’s familiar faces and did not find them. Her blood ran cold and she felt a bit afraid. So she had no choice but to follow Ginny. Libby stepped aboard the train to find small little rooms that lined one side of the train car. Ginny’s head was vanishing into the second one and Libby pressed forward. “Sit here,” Ginny instructed her, patting the bench beside her. Libby did as she was told, feeling awkward. Ginny had probably known the others in the cabin her whole life. She felt almost like an intruder. They exchanged pleasantries and the whistle blew loudly once again. “I expect we’ll be taking off soon,” Ginny smiled. “So what happens when we get there,” Libby asked with a raise in her brow. “You’re American, aren’t you?” Luna blurted out. Libby shrunk back as if she had done something wrong. “It just so happens that she is,” Ginny said seeing Libby’s expression and flashing a look at Luna that she clearly didn’t understand. “How is it you came to be at Hogwarts?” Luna asked. Her tone was of complete curiosity and not taunting or viscious. “Dumbledore?” Luna finished for her. “Yes, him. I suppose he has all the answers to this little mystery,” Libby said feeling defeated and more of an outcast. “Well, don’t be afraid of being different. I’m different and I like who I am. Sometimes others just don’t understand what they perceive to be odd. It isn’t their fault, really,” Luna added in her dreamy sort of voice. “I think there’s a difference between being odd and an outsider,” Libby said sitting back on the bench seat, her arms crossing over her chest in a sort of frustrated pout. The train lurched and started forward, slowly at first and accelerating to a healthy speed…for a train. Libby watched the scenery as it sped by and disappeared behind them. “So what do you know about Hogwarts?” the girl named Alice asked demurely. The three girls looked from one to the other waiting for one of them to say something. “Yes, and then you will be sorted before the feast into the house you will belong to during your schooling,” said Luna. “And then we go to our dormitories, each house has their own,” Alice added as though it were her favorite part. “So what are the houses you’re talking about?” Libby asked, a new fear threatening to strangle her. What if she was cast out by herself and knew no one? “I don’t think I want to be put in there…” Libby said nervously chewing the inside of her cheek. “What did you mean about a sorting hat?” Libby asked. Libby had her mouth open to reply when a strong feeling of dread came over her like the chilling waters of the lake in McCall. The difference was, at that moment, she felt like crying. Goosebumps erupted all over her body and the train slowed, slamming the compartment door shut. “What’s going on?” she heard herself cry out. All three girls were staring at Libby and then, the train just stopped and the lights flickered in the little cabins. Rain pounded the window creating beads of water that dripped down the glass leaving long trails of sadness in their wake. Libby could hear something, like the rattling wheezing of a severe asthmatic breathing in her ear and she could see shadows beyond the glass in the compartment door. Wispy shadows that resembled nothing she had ever witnessed before stopped right in front of their door. She covered her face with her hands to hide her tears; so much sadness and terror filling her heart until she thought she would die from the pain. In her mind, she tumbled into the darkness where it threatened to swallow her up forever. Time ticked by so slowly it felt like hours passed before a bright light descended down the corridor and just as quickly as it had begun, it was over; leaving Libby to wonder what in the world had just happened to her. So I spent the last week watching the whole Harry Potter series again. I’ve probably seen it fifty times and I never tire of it. But I found out something this week… Harry Potter motivates me. He is a muse of sorts that encourages me to create and write. J.K. Rowling’s documentary makes me feel that my dreams are just as possible as hers were. That I’m just as ordinary and down to earth as she is and I’m just as deserving to watch my dreams become reality. This week, magic happened. It’s funny how spending your time out of work with those characters can trick your mind into feeling like they are your close friends. You laugh with them, cry with them, you’re scared with them, and you love with them. And so I woke up yesterday feeling compelled to write myself into the amazing world of Harry Potter. I’ve never written any kind of fan fiction before, but I thought it was a lot of fun and I’m sure I will do more of it. I found it to be almost more therapeutic than writing my own stories in my own worlds. To escape to another world for a while is pure magic in itself. I felt just as lost through writing it as I would have being thrown into it. The few hours of make believe were very good for me today and the drinking of homemade Butterbeer set the mood. I’m sharing here because I can’t do much with it aside from blogging it. But I hope you can relate to Libby. I think most of us have a little Libby inside. The Odd Brick Wall that isn’t a Brick Wall at all. Life is a curious thing. Most of the time, when you most want something it never happens. Sometimes, it will surprise you and magic happens. There was such a time for Libby Archibald. Summer was Libby’s favorite time of the year. Not because it was hot and ice cream was best eaten when it was hot, but because she could be outside and escape the confining walls of her house. Every year, the Archibald family traveled several hours to a special place in the mountains and it was here that Libby felt alive. The smell of the pine trees, the fresh air, and the sound of the lake lapping at the shore brought her a sense of peace. A whole year of fighting her way through life was kindly rewarded with one week in the small town of McCall. And so Libby crossed the busy main street that ran close to the water, her family was lazing about on the warm, sandy beach or swimming in the shallow waters close to their vacation rental. “Is it okay if I walk to get ice cream?” she had asked her parents. She was bored and they were occupied with spreading suntan lotion over their arms and legs. “I suppose, Libby. Don’t be too long,” her mother sighed and laid herself out over the bold blue and white striped beach towel. “Thanks, mom,” Libby replied and shoved her slender hand in the pocket of her pink capris to feel for her five dollar bill. Now, she was walking beneath the eaves that cast the sidewalk in shadow. A breeze blowing in from the water made the shade feel cool as Libby made a left turn between the coffee shop and the souvenir store. It was a narrow passage partially blocked by a staircase in the alley and reminded her of some secret place. Starting down the short pathway, the gravel crunching beneath her flip flops, Libby took her time staring at the brick wall on the left, the names on all the bricks fascinating her. She always wanted to scratch her name on one too, but it appeared that all the bricks were used up with other names. There were several Makenzies and many Mikes but nowhere did she see her name. That was one thing Libby really hated; her name was never found on anything but vegetable cans. Sometimes she wished her name was Sarah or Mary so she could be ordinary and fit in. Two bigger kids, probably a girlfriend and a boyfriend, walked by with cups of the creamy goodness that only Ice Cream Alley could offer. As they passed, the boy’s elbow poked her just behind her ear and she rubbed at it furiously to ease the pain. “Stupid kids. Why can’t they stay by their parents? They just get in the way,” the boy remarked and continued on his way. Comments such as that one were not new to Libby. Being the oldest of the four children in a very strict household, she was often made an example to her siblings by her father. She was never right as it wasn’t a child’s right to be correct. It was the grown-up’s right to always be the smartest. Libby couldn’t wait to be an adult so she could move far away and be who she wanted to be. Rounding the corner, there was a line of about ten people waiting to get their hands on the cold ice cream in nearly every flavor imaginable. “I wish I was magic. I could make everyone disappear and it would be my turn,” she sighed taking her place at the end of the line. Nearly every table was full of people, some in shorts and some in swimsuits, umbrellas were unfolded overhead for a bit of shade. There were a few small children sitting on a bench swing that were screeching in fun, ice cream rings surrounding their lips in the various colors of the flavors they chose. Their parents sat nearby, never saying a word, not telling them to be quiet…Libby could imagine how the veins would bulge out of her father’s forehead and neck because they were being so unruly. If that was her trying to have fun, he would have walked right up to her and thumped her in the back of her head or he might even grab those tiny hairs at the base of her neck and twist them enough to bring tears to her eyes and force her to just sit quietly. That’s when he liked her the most; when she was silent and still. It was the pleasure she felt in these moments, when she was by herself and could breathe without fear of wrongdoing. Yes, these moments made it all worth while. It was time away from her very annoying family, it was time away from the horrid kids at school that teased her mercilessly, and it was time spent getting to know who she really was. You see, Libby was shy and quite backward. She didn’t like to talk out of fear of being incorrect. Some viewed this as rude. For Libby, it was a defense mechanism. It was safe just to be quiet. Rarely could you get Libby to make eye contact with you because she knew others would see the story she held behind her eyes that had recently changed from light blue to a beautiful shade of green. This girl was down right skinny with knobby knees and elbows and crooked teeth. She sported dark brown hair with a hint of red that her mother kept short in a most embarrassing “wedge” style. Libby would look at her sister with the pretty blonde strands that flowed perfectly to her shoulders and felt jealousy that Adrianna looked like a girl and she herself looked like a boy. It wasn’t fair. The kids at school were cruel and asked her why she looked like a boy. They poked such fun at her expense when she spent time with her friends that were girls, that Libby stopped making friends at all. would wear longer pants and shirts with sleeves all year round just to conceal it. Nevertheless, it didn’t stop the taunting and if she ran from the kids, they would run after her shouting “Monkey Girl, Monkey Girl” all the louder. Absently, Libby ran her hands over her arms self-consciously and stepped forward in the line. It was almost her turn. She could almost feel the icy goodness running down her throat. It was getting hot. An odd place on the brick wall stood out to Libby. She hadn’t ever noticed it before on their many visits to Ice Cream Alley. The bricks were arranged in a different pattern and the cement was thicker around them. All the people, it seemed, never looked up and saw it. They just went on as though nothing was out of the ordinary. Like they were blind to the different pattern. Or perhaps they just didn’t care that it was odd. Libby wondered a moment why the wall got no attention for being odd but she got more than her share. Where was the justice in that? “What can I get started for you?” the girl behind the whitewashed counter asked snapping Libby from her thoughts about the wall. Shyly, Libby stepped forward and barely peered over the counter, she was so short for her eleven years. “Um, a single scoop of Rocky Road in a cup, please.” She handed over her five dollars and the girl handed her back some change. “It will be ready around the corner, thank you!” the employee said, motioning her along to the other side of the small building that looked more like a lemonade stand than an ice cream shop. Libby sauntered around the corner to wait for her delightful concoction of chocolate, almonds, and marshmallows. A couple behind her at a smaller table stood up to leave and so she decided to take that place for herself. 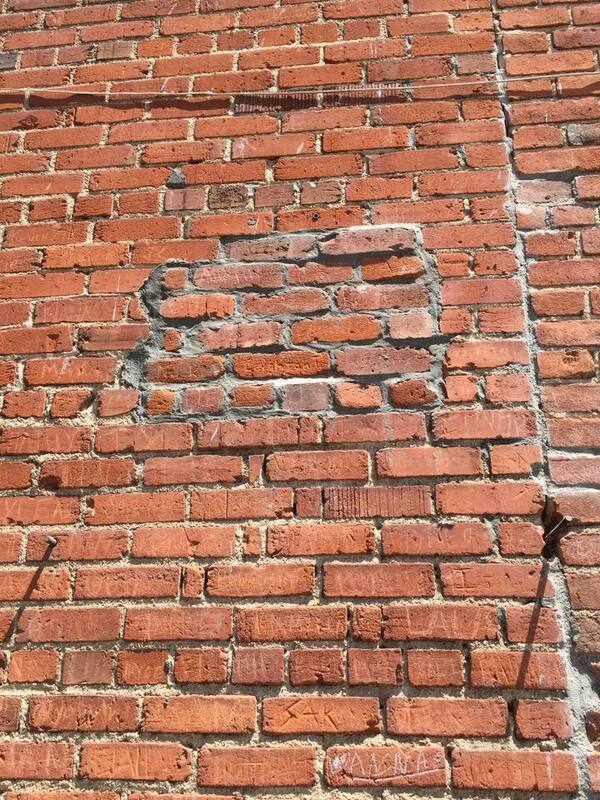 It was almost directly below the imperfect bricks she had noticed just moments before. Another gal bellowed out that the Rocky Road was up so Libby hurriedly grabbed it, a spoon and a napkin, returning to the table she had claimed. Her eyes closed as the heavenly explosion happened in her mouth as the first bite of some of the best Rocky Road ice cream danced on her tastebuds. It was smooth and cold, the marshmallows were fluffy on her tongue. She gave a slight grin and reopened her eyes. She scanned the crowd for her father before she picked up a pebble and tossed it up to hit the rebellious pattern in the brick wall. Missing her target, she tried again and her pebble found one of the lower bricks. She gave a chuckle and grabbed an arsenal of rocks throwing them one at a time, each connecting solidly. Libby was just about to throw another when she noticed the wall starting to move. She sat upright in her chair and stared in disbelief as the wall began to rip open and she could see a room on the other side. Libby tore her eyes from the sight and glanced around to see if anyone else was witnessing this incredible phenomenon. No one was paying attention. No one cared. They were all absorbed in their own world, laughing, joking, and enjoying each other’s company. No, no one was watching Libby and the ripped open brick wall. Cautiously, she stood and walked the four steps to the opening where she peered inside. No one in the dingy room ahead seemed to notice her either. It was dark in there with weathered wood walls, plank floors and lanterns for lights. There was no music and tones felt hushed without stepping foot in there. Casting a quick backward glance, her heart beating wildly in her chest, Libby took a chance. For the first time in her young life, she stepped forward out of everything she had ever known and stepped into a world so foreign it frightened her. Once both feet were firmly planted in the strange place on the other side of the bricks, the wall knitted itself back together until it was just as before. Libby quickly turned and placed her hands on the wall, pressing and tapping to find that opening…but there wasn’t one. It was solid. There was nowhere to go but forward. Libby slowly turned around and tried to slow her breathing. She forced herself to swallow hard and soaked up her surroundings. The room looked to be a restaurant or a bar of some kind with several tables and chairs and a long bar area with a large man standing behind the counter, a white apron tied around his waist and a towel thrown over his shoulder. There were a few people at tables and as she walked through the small establishment, she saw three young people talking quietly at a table in the corner. From their hairstyles, she guessed it was two boys and a girl. All had dark clothes on, coats of sorts with hoods. One had dark disheveled hair, one bright red that stood out, and the girl looked to have frizzy hair that fell just past her shoulders. The dark headed boy happened to cast his glance beyond his red-headed friend before him and he narrowed his eyes behind round spectacles to look right at Libby. He muttered something and stood, the other two twisting in their seats looking on curiously. “I recognize that look,” he smiled at Libby. “This is The Leaky Cauldron. My name is Harry, this is Ron and Hermione. What is your name?” he asked. “Nice to meet you, Libby. You have the same look on your face I did a couple of years ago. It’s a lot to take in all at once. Come sit down and we’ll talk about it,” Harry said motioning to the empty seat at the table. Not knowing what else to do, Libby sat and Hermione went to order one more Butterbeer for their table. “Are you a muggle?” Ron blurted out. “A muggle is a person who can’t do magic. They don’t see magic and they rarely feel it. They are just ordinary people in a boring world,” Harry explained. Libby nodded her head. “Yes, that is me. I’m a muggle. Boring person in a boring world,” she breathed. “How do you know? That you’re a muggle, I mean. How do you know?” Harry asked her. “Well because everyone knows there is no such thing as magic, Harry. That is what makes up storybooks and movies. And Disneyland. Disneyland is pretty magical, I think, but I’ve never been there. I’ve only seen pictures, you see…” Libby rambled on. Ron and Harry looked at each other and grinned. “So you think you are not magical because other people told you so?” Harry asked her. “I mean, why would you listen to boring people who can’t see anything that’s right in front of them? Why would you trust those kind of people to tell you who you are?” Harry asked her. Libby unfolded the gift and discovered that it was the same kind of cloak the others were wearing. As she flung it around her shoulders, it was easy to notice that Hermione was right. Her pink pants and yellow shirt with pink stars were like sunshine in a cave. She definitely looked out of place…a misfit. The funny thing about it was that she looked like everyone else in her own world and was treated like the outcast. Here in a completely foreign world, she looked like the misfit but was treated like she was the same as everyone else. “I just turned eleven,” Libby explained. An awkward silence wound around the four young people and they all grabbed their mugs to gulp at the sweet, frothy Butterbeer. “I’m sure there is a way, but we need to find someone like Hagrid or maybe your dad, Ron, to help us. This is a most curious situation.” Harry said. Ginny stood upright and squinted her eyes at him. “I don’t know, she just told me to come get you! Who’s that?” she asked, her eyes widening again when she saw Libby. They all said their goodbyes to Ron and Ginny and made to set off in search of someone who could give them some answers. Join my Lords & Ladies Club! Click my logo! In Celebration of Indie Authors Everywhere!